Chirality is an exciting but potentially tricky topic in organic chemistry. Why? because it’s tough to visualize 2-dimensional drawings as a 3-dimensional structure. But don’t be like the thousands of students struggling with this topic. My chirality series will take you through this topic step by step to ensure that you master and truly understand. Starting with video 1 below – learn exactly WHAT this is all about. From chiral carbon requirements to enantiomers as non-superimposable mirror images. 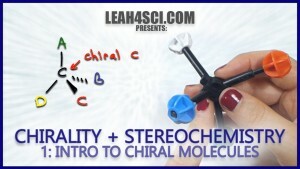 This is Video 1 in the Chirality/Stereochemistry Video Series. Click HERE for the entire series. Would a Model Kit help you? Watch How to Use Your Organic Chemistry Model Kit. This was a BIG!! help to me thank you so much. thats very helpfull for me..
i find troubl in downloading this video. Great teaching video but a sequence in the video seems contradictory. When illustrating an achiral molecule with three substituents, the molecule is shown to be a mirror image and superimposable because two substituents are the same. Then later when summarizing the video states and I quote ” Notice there’s a line of symmetry going right down the center. Again a line of symmetry no matter how I turn it I can find that symmetry and that makes this molecule achiral because this molecule has a tetrahedral sp3 carbon in the center. But two of the same substituents for a total of three unique, it’s not chiral. And if it’s not chiral, IT DOESN”T HAVE A MIRROR IMAGE, its going to be superimposable, and another molecule of its kind.” This confuses me totally!!!! You’re very good at explaining. Started to love Organic Chem because of your tutorials. You’re awesome. I’m only seeing one Video 1 under Chirality and Stereochemistry. Am I missing the others or are they on the way soon? Thanks.